Super Savings Item! 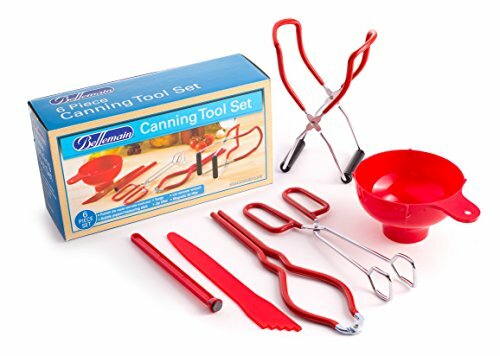 Save 37% on the Bellemain 6 Piece Canning Tool Set - Vinyl Coated Stainless Steel by Bellemain at Baking Love. MPN: NA. Hurry! Limited time offer. Offer valid only while supplies last. Whether you're a novice or an expert at canning your own fruits and vegetables, these tools will make the process easier, safer and more convenient. Whether you're a novice or an expert at canning your own fruits and vegetables, these tools will make the process easier, safer and more convenient. Durably made of top quality materials, they'll help you through many a "putting up" season. This versatile design is made of heavy-duty plastic; 2.125" diameter at the bottom and 4.75" diameter at the top, it fits both standard and wide mouth jars. Vent notches help foods flow through faster, and a thumb grip makes it easy to remove the funnel from the jar without getting your hands messy. Scissor action adjustment and a nonslip vinyl coating lets you safely lift canning jars of any size from the boiling water, minimizing the risk of burns or breakages. The handles are also vinyl coated for a more secure grip. It takes the danger out of removing lids from their boiling sterilization bath. Just touch the magnet to a lid and lift it out, hands free ... which also means that it stays perfectly sterile. Move jars around inside the canning bath or food around inside the jars while keeping your hands away from boiling-hot liquids. Vinyl coating on the handles and texture nodes on the grabbers provide a better grip at both ends. This heat-resistant plastic wand makes quick work of removing bubbles from the processed jars before you put on the lids. Measurement marks on the other end make sure that filled jars have the proper amount of "head room." Heat-resistant vinyl cushioning helps protect jars from breaking and fingers from burning while you tighten the outer lid rings. Once the seal is complete, it helps remove the rings for reuse and to extend their life. CAPTURE THE FLAVORS OF THE SEASON AT THEIR PEAK OF FRESHNESS: Use these six essential canning tools: Wide-mouth funnel, jar lifter, magnetic lid lifter, tongs, bubble popper/measuring stick and lid remover wrench. PREMIUM QUALITY VINYL COATED STAINLESS STEEL: The jar lifter, tongs and the lid remover wrench are made of heavy duty stainless steel to prevent rusting and promote easy care. PROTECT YOURSELF FROM SERIOUS BURNS: The vinyl coating doesn't just look great, it cushions the tools to keep the jars from breaking while also preventing your fingers and hands from burns. FUSS-FREE MAINTENANCE: Just pop these tools into the dishwasher when you're finished and they'll be ready for you the next time you need them. CONTAINS EVERYTHING YOU NEED: Getting your fresh, healthy fruits and vegetables safely into their jars couldn't be easier with these specialty tools. These durable utensils will last for years to come.